Wild Darlings Sing The Blues, And It’s A Song of Freedom a radical movie about healing, using filmmaking as movement meditation. Nova Scott-James is a filmmaker, artist and creative coach from Harlem, NYC. Her childhood experiences of being flooded with the sounds and culture of jazz has impacted her creative aesthetic greatly as her work honors improvisation, altered states of consciousness, ritual and collaboration. Nova is an adjunct instructor at the NYU Tisch School of The Arts teaching filming in intensive programs for high school students.Two of her short films have played at the Film Society of Lincoln Center in the New York African Film Festival ‘Handmade in Thamaga’, a documentary short about a women’s pottery collective in Botswana, and ‘My Third Eye’, a narrative short about a young girl’s spiritual awakening after being sexually abused by a family member. Nova is also a reiki practitioner and dedicated intuitive worker – she uses these abilities to serve people as a director and creative coach by guiding them in honoring their creative genius. Abou is a producer, artist and anthropologist teaching at the New School for Social Research. His latest work as co -writer and producer , ‘Icaros: A Vision’ offers a surreal portal to healing in the jungle. The story follows a young woman who travels to peru to seek healing using the native medicine of ayahuasca. 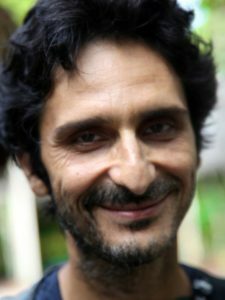 He has long worked with award-winning director Amir Naderi, with a producer credit on ‘Vegas: Based on a True Story’, an official selection in competition at the Venice and Tribeca Film Festivals; and co-writer on ‘CUT!’, selected for Venice, Tribeca, Toronto and Pusan. As part of the artist duo caraballo-farman, Abou has exhibited work internationally, including at the Tate Modern, UK, PS1/MOMA, NY, and the Havana Biennial. Published widely in Canada and the US, his essays have been nominated for a National Magazine Award in Canada and twice awarded the Critics Desk Award by Canada’s national poetry magazine. He is the author of Clerks of the Passage. 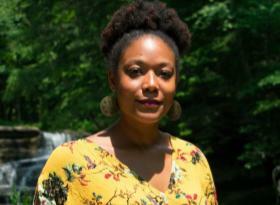 Born in Brooklyn, New York to immigrant parents from the caribbean, Dr. Gillian Scott-Ward, is a first-time filmmaker and clinical psychologist in New York City. After completing her undergraduate degree at Cornell University in Psychology and Women’s Studies, Gillian pursued her PhD in Clinical Psychology at the City University of New York. She completed her dissertation on the impact of media stereotypes on Black students. In 2013 while working as a psychologist at Barnard College, she began production on her first, feature-length documentary, Back to Natural. 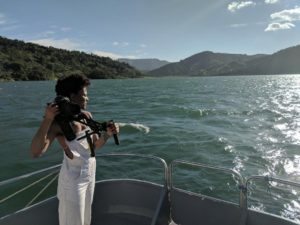 She was inspired to embark on this film after deciding to start her own natural hair journey and seeing the conflicts her patients struggled with regarding hair, racial identity and authenticity. In 2017, Back to Natural began its film festival tour and has been seen at over 15 film festivals on three continents. She brings to the film experience as an artist and healer. She hopes Back to Natural inspires dialogue, self-reflection, compassion, as well as individual and community healing. Back to Natural is a 69-minute documentary film that reveals the shocking truth about hair, politics, and racial identity in Black communities and beyond. Directed by New York City based Clinical Psychologist Gillian Scott-Ward, the film was inspired by the work she was doing in her clinical practice and her own drive to go natural. Back to Natural is a powerful call for healing that takes a grassroots approach to exploring the globalized policing of natural Black hair. Filmed in New York City, Philadelphia, Paris, And Cape Town, this documentary explores universal aspects of the Black experience and the “New” Natural Hair movement. Join us on this journey of discovery and enlightenment while celebrating our history and natural styles that are taking the world by storm. Special thanks to: Sekou Campbell, Ellie Shanahan, Althea James, Bjorn Roe, Julie Patton, Arys Jimenez, Hannah Thomas, Ashley Vega and Jasmine Vega. Your generous tax-deductible contribution will help Women’s Voices Now support Nova Scott-James and Abou Farmancomplete this important project of healing. We accept checks, credit card via PayPal, and donations of appreciated stock. Contact heidi@womensvoicesnow.org if you would like to make a direct bank/wire transfer.